The 2018 ADAC Zurich Nürburgring 24 Hours turned into a thrilling sprint to the finish after a late red flag period for fog, the #912 of Manthay Porsche 911 GT3 R crossing the line first after taking the lead just before the final hour began, scoring both the team and Porsche its first N24 win since 2011. 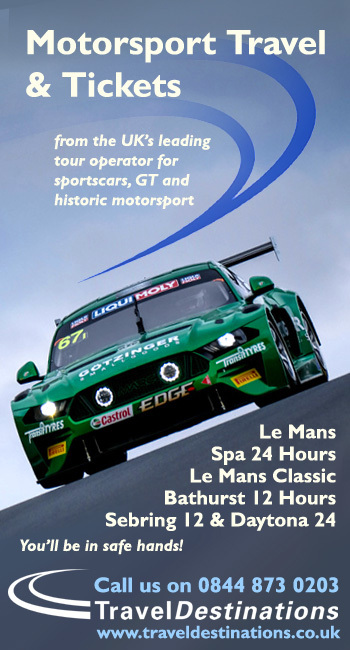 Fred Makowiecki drove a stunning 80 minute stint after red flag period due to fog. In the end, the winning Porsche, of Makowiecki, Patrick Pilet, Nick Tandy and Richard Lietz completed 132 laps and slowed to run out the clock in the treacherous conditions, but the last lap was not indicative of the last part of the race. While the fog never really lifted, the race was restarted behind the safety car and was run for 10 laps. 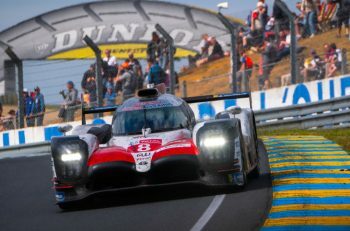 This presented a tactical battle for the teams to delay their final stop as much as they could, and for the drivers to pass or defend on track and to make sure you don’t fall off the road. But the drivers had other things to focus on – there was the fight for first between Makowiecki and the Mercedes of Adam Christodoulou; and there was a battle for third between the Mercedes of Hubert Haupt, Yelmer Buurman and the Aston Martin of Maxime Martin. Under the red flag period, the teams were able to work on the cars meaning the cars were full of fuel and the top teams ran longer stints than they had been doing during the bulk of the race. As the race went to green Christodoulou led Makowiecki but the Porsche had the pace. Over a couple of laps the pair battled before Christodoulou outbreaked himself in the first corner. This allowed the Porsche to pass for the lead. Christodoulou did not want to give up and pushed to stay in touch with Makowiecki. They were nose to tail when Christodoulou ran wide and nurfed the barrier. While the car was fine, the run for victory was essently over as on track battle. Equally the three way fight for third. Haupt led at the restart from Martin – who had been unlucky to lose the place due to a pitstop and the timing of the red flag. Buurman was a little way behind but made up the gap to join a three way fight. Haupt was first passed by Martin for third with Buurman also getting through on Haupt. Though, it seemed that Buurman was a man on a mission. He also got through on Martin and proceeded to pull out a gap of up to eight-seconds a lap. The pitstops came with just one lap to go but these did nothing to change the order at the front. The win for the #912 was hard fought as they had a puncture on the opening lap and a 3:32 minute penalty for speeding under the Code 60. 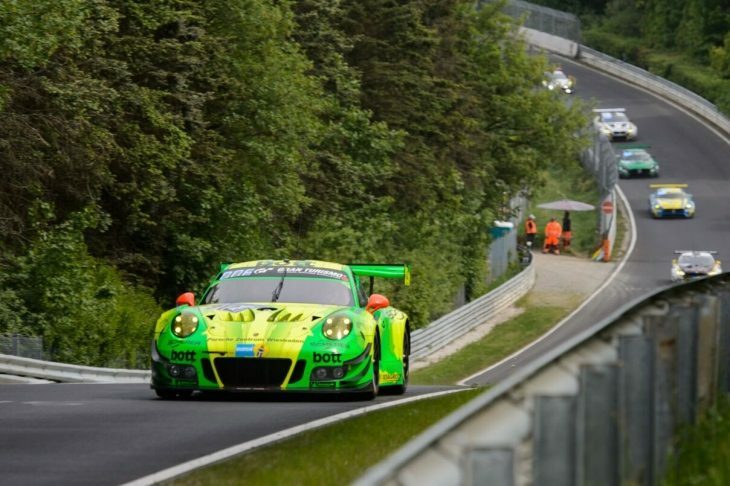 As such, it was Porsche’s first win at the Nurburgring 24 since 2011 and Manthey’s sixth win – they now hold the record for the most outright wins for any team at this race. It also put Richard Leitz, Makowiecki, Patrick Pilet and Nick Tandy on the top step. 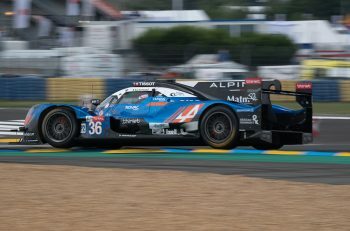 While at times it looked like Porsche would throw away the win despite their dominant pace and a 1-2-3 in qualifying, they came back in the race to take a strong win in challenging conditions. While the #7 Aston Martin missed the overall podium the did take their own SP-9LG class; the Glickenhaus SCG003b took SP-X; the #190 Mercedes won SP-8T; the #55 Prospeed Porsche took SP-7; the #202 Isert KTM took Cup-X; the #302 Mühlner Motorsport Porsche took Cup-3; the #320 Care For Climate Porsche won AT; the #178 LMS Racing Seat took TCR; the 256 Securtal Sorg BMW won Cup 5; the #45 rent2Drive Familia Racing took SP8; the #65 Proom Porsche took SP-6; the #66 Black Falcon Team Identica took SP-10; #138 Black Falcon Team TMD Friction took V6; #90 Subaru took SP-3T; #144 Pixum Team Adrenalin took V5; #126 aufkleben.de Renault took SP-3; #155 Securtal Sorg Rennsport Porsche took V4; the #63 Dörr Motorsport Lamborghini took SP-Y; the #165 rent2Drive Familia Racing Renault took V2T; the #325 Scuderia Solagon BMW took V4; #86 MSC Sinzig VW took SP-4T; #56 Toyota Gazoo Racing Lexus took SP-PRO; and the V3T #718 Porsche won despite only completing six laps.